Piedmont Park expansion continues at the park’s far northern end near Ansley Mall. This phase of expansion comes after completion of a 26-acre expansion in 2011 that included two dog parks, the Greensward Promenade plaza and fountains, and the Six Spring Wetlands. The past two years has given the park conservancy time to raise additional funds for this year’s expansion. 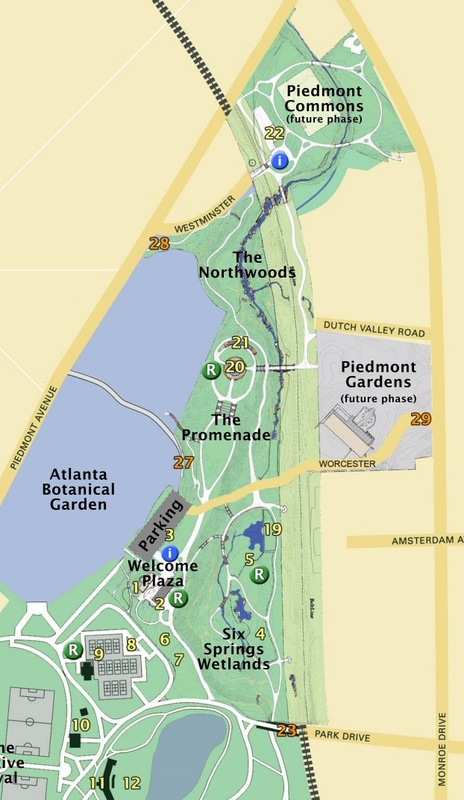 The additional 53 acres to be added this year include Piedmont Commons, The Northwoods and Piedmont Gardens (see map). Challenges include “excavating industrial waste, whacking away gnarly masses of invasive kudzu, breaking up concrete creek beds, shoring up erosion and helping build a new utility and irrigation infrastructure” in the Piedmont Commons area. This entry was posted in news and tagged 2013, midtown, morningside, parks, piedmontpark by Kay Stephenson. Bookmark the permalink.